The Modern Soccer Coach books, by renowned coach and coach educator Gary Curneen, are some of the best-selling and most acclaimed soccer coaching books of recent years. Now, all three titles are available in one volume. For soccer coaches of all levels and with players of all ages and abilities, The Modern Soccer Coach 2014 identifies the areas that must be targeted by coaches who want to maximize a team’s potential – the Technical, Tactical, Physical, and Mental sides to the game. 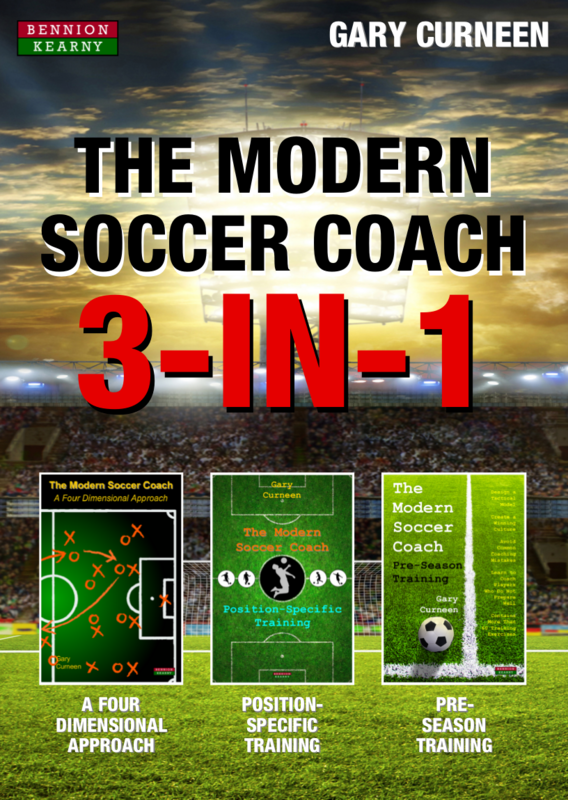 Filled with practical, no-nonsense explanations, focused player drills, and more than 30 illustrated soccer coaching templates, it will help you – the modern coach – to create team performances that win match after match. This book seeks to identify, develop, and enhance the skills and functions of the modern soccer player whatever their position and role on the pitch. Central Defenders, Full Backs, Holding Midfielders, Attacking Midfielders, Wide Attackers, and Centre Forwards are all covered. It offers unique insight into how to develop an elite program that can both improve players and win games. Comprised of hands-on explanations, player drills, and over 40 session plans, this book will help coaches to construct a coaching environment that will take players to the next level. This book looks at how pre-season has changed over the past ten years, and offers ways for coaches to adapt their work and methods to deal with these changes accordingly. Pre-season is about much more than fitness testing, long-distance running, and gruelling physical work. It’s about new, innovative ways to engage players so that they want to train at the maximum every day, and push towards new limits for the new season ahead. With over 60 training exercises designed specifically to challenge your players to their maximum physically, technically, tactically, and mentally, this is pre-season training like you have never seen it before. Book Categories: Gary Curneen and Soccer Coaching Books.